It's not very often that we have two different clones of the spectacular Stanhopea platyceras flowering in close proximity, so this was a good opportunity for comparison. It's easy to forget how variable some species can be. ABG 20041565 has a long narrow hypochile that is relatively lightly spotted. The second clone, ABG 20140724, has a stouter hypochile with spots that have almost coalesced into a deep purple (intensified in this flower after day three). Platyceras means 'broad flat horns', a characteristic that is more striking in the second clone. 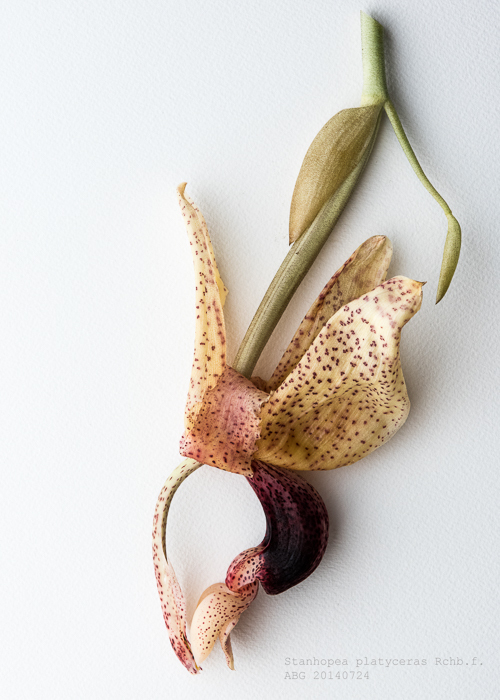 Stanhopea platyceras flowers are big (4 inches across) and almost everyone who sees them stops for a second look. They seemed to be the most photographed orchids in the Orchid Center when they flowered. 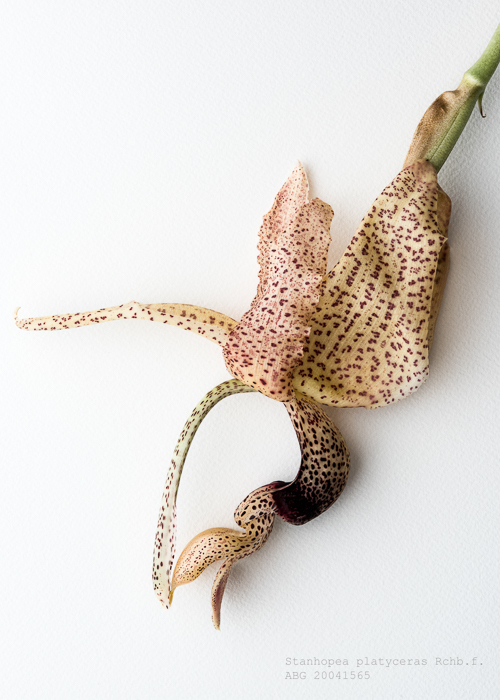 Stanhopea platyceras is endemic to Colombia, according to Rudolf Jenny, where it grows at 1000 to 1500 meters elevation. We grow our plants in an intermediate greenhouse in 70% shade. I'm happy to report two capsules developing on 20041565, the result of selfings. One capsule will go to the lab for seedling production, the other will be photographed.